After you and your doctor have finally decided on moving to a surgical approach for your fractured or deformed hips, the question on which type of implant best suits your condition may then arise. During this time, there are several factors that you and your doctor may need to discuss first before settling on the right materials your implant should be made of. Here is a list of the top four implants that may be used in hip replacement procedures. 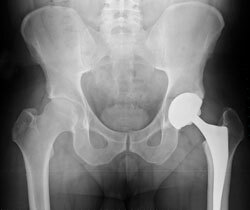 Metal-on-plastic hip implants. These are the oldest types of hip replacements that have been used since early 1960s. The femoral stem and head are made of metals (such as alloy or cobalt chrome) and the socket is lined with a special type of plastic known as polyethylene. These have been the mostly recommended type of hip replacement in the past, especially since it is also the most affordable type. Metal-on-metal hip replacements. All components of the hip implant are made out of metals (mostly of titanium or stainless steel). When compared to metal-on-plastic materials that have been noted to wear away at a rate of 0.1 millimeters every year, all-metal hip implants are reported to have a lesser erosion rate. However, there have been increasing concerns about the serious side effects connected with it such as the most recent news about the need to redo the surgery at a time earlier than expected. These materials are supposed to last for more than 15 years, yet there were thousands of recipients who had to go through reconstructive surgical procedures due to frequent dislocations and infections. Ceramic-on-Ceramic Hip Replacement Devices. Studies have shown that these implants, which are entirely made of high-strength ceramic materials, are the most durable types. Complications following surgery are also lesser when these types of implants are used. However, in some instances, device breakage inside the body and disturbing squeaking sounds on movement may also be experienced by some patients. Still, most doctors believe these are the safest materials for a hip replacement. Most of the time, the surgeon will have to consider your age, gender and physical activities before deciding on which implant to use on you surgery. Moreover, it is also best if he or she has already performed successful operations in the past with the type of hip joint prosthesis that will be implanted into your bones. If you are unsure of the information you are getting from your surgeon, you may also seek other recommendations from another healthcare professional or you may as well get the latest hip implant news from the U.S. Food and Drug Administration’s website. Check this drug injury lawsuit site for more news and updates on injury lawsuits.